I haven’t done a proper New Year’s resolutions blog post this year, but one of the things I want to try to do is workout more. I’ve been trying to do more pilates and Wii sport (yeah, I know that’s not “proper” working out, but it’s COLD outside), but I really need to get out of the house more and start running again. So when Nike contacted me whether I wanted to order a pair of shoes through their online store for free, I thought that was a great way to get running again! 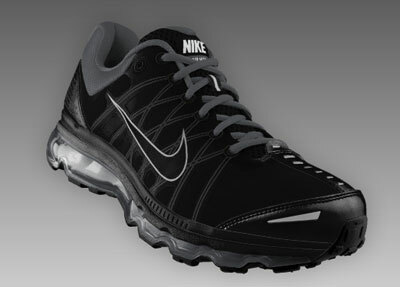 About 3 years ago, I ordered a gorgeous pair of Nike shoes which I completely customized (see above). 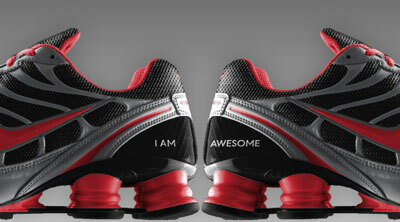 You could choose your own colours, put special text on them and even choose different size shoes per foot. Now for most people that last option is completely useless, but for me with my two different sized feet (which is so very very annoying) it’s perfect. I wish more companies offered the option of doing that! After looking around on the Nike website though, I realized that I’m still perfectly happy with the Nike pair I still have. They are 3 years old, but still perfectly fine. So instead I surprised Cristiano with a gift voucher! He customized a cool pair of running shoes, so that we can start jogging together again. The Nike store customization site isn’t much different than it was 3 years ago. There’s quite a huge range of models to pick from, and with each model you can choose from a range of colours (and in some cases also materials). Then with some designs you can choose different sizes per foot, and the type of width (narrow, regular or wide). Finally, with almost all the shoes you can specify your “iD”, special text that can be anything you want, although it depends per model where that text is placed and how many characters you have (with some it’s on the heel, others on the side, and with others on the front). The easiest way to customize a pair is to start off with a blank pair. You can then see exactly which pieces of the shoes you can choose the colour for and keep track of which ones you’ve already selected. Btw, if you’ve got the Nike+ iPod set (or plan to get one in the future), make sure you pick a model with a + in the name; those designs have special compartments in the soles to place the iPod transmitter. It might be a bit of a cheesy tip, but for me having a pair of pretty jogging shoes, ones that I actually put some of my own time into designing, is a great way to motivate myself to run again. Just looking at the pair above makes me wanna go outside and run again! If you want to design your own pair of Nike shoes, check out the Nike store. Fill in the code FREEDEL at checkout to receive free delivery.